I always have such healthy eating goals after the sugary (and delicious!) excess of the holidays. So, I've started brainstorming some healthier snack options and decided to make hummus. Over the weekend, I made a double batch of it and we have been enjoying it! The kids even like it which is always a plus! 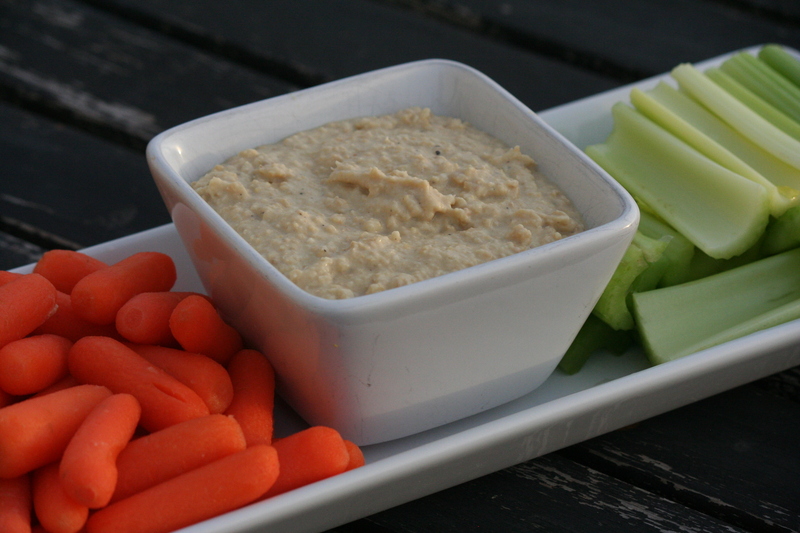 I serve it with carrots, celery, and pretzels - the best compliment is our three-year-old proclaiming, "I loooove hummus." Too cute! Anyway, this is a quick, easy, and inexpensive snack or side dish. So yummy! You could easily add roasted red peppers or cilantro or other flavors to change it. In a blender or food processor, pour garbanzo beans into blender with chopped garlic. Add lemon juice, tahini, chopped garlic and salt in blender. Blend until creamy and well mixed. Transfer the mixture to a serving bowl or storage container. To serve, sprinkle with pepper and parsley, and drizzle olive oil over the top. do you know how long this keeps in your fridge? i need to try making my own. i like hummus but never love the texture of home made versus store bought. maybe if i blend it longer it will more what i'm looking for? I serve it with pita, cucumbers, red peppers, carrots, celery, grape tomatoes, green peppers...it goes well with all of them. Sometimes we do pita sandwiches in the pita pockets with hummus, lettuce, cucumbers, red peppers and/or sliced tomatoes and feta cheese. Beautiful and tasty! I forgot to put that I used my food processor (went back and added that!) and I think that actually contributed the light and fluffy texture. I was going to say that I think it will last for a week in the fridge without a problem - you could easily check a container at the store and see how long they say you can keep it after opening (as long as it is a preservative free one). Thanks, Rachel, for the tips and Liz, let us know if you make it!